Athens lies within the Humid subtropical climate zone, with hot, humid summers and mild to moderately cold winters. Annual rainfall averages 49.7 inches. Light to moderate snowfall can occur in winter. In the spring, frequent thunderstorms can sometimes become severe, even producing tornadoes. These conditions are usually synonymous with foundation repairs, and know you have a foundation repair Athens Georgia partner in Atlas Piers of Atlanta. With the extreme changes in weather your home in Athens, Georgia could be at risk of settlement problems due to the ever changing conditions of the soil around your home’s foundation. If these settlement problems are severe enough you may be in need of foundation repair. Atlas Piers of Atlanta offers our foundation repair services to Athens. We can install resistance piers and helical piers, and have quality products to do the job right. Our underpinning products are only “the very best” from Earth Contact Products. With little disruption to your everyday life, Atlas Piers can be in and out our your home in no time. We take pride in our quality work and ensure that we have the best professionals working for us in this industry. With an installation of our underpinning products we will be able to transfer the load needed to lift and support that load. When it comes to understanding underpinning, with our 25 plus years in the industry, we can handle any foundation repair Athens Georgia problem that comes our way. Underpinning is not the only service that Atlas Piers can supply, however. We also offer a variety of services in other areas, including: pressure grouting, helical tiebacks, carbon fiber repairs, and wall encapsulation. 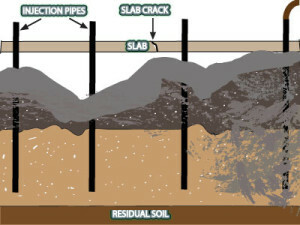 Pressure grouting is a void filling method that, like underpinning with resistance piers, can be used to lift and stabilize sinking or settling foundations. In this process, a grout is injected beneath the foundation to fill voids, lifting the structure and supporting the foundation. For basement wall repair, helical tiebacks and carbon fiber repairs are both excellent choices. Helical tiebacks are anchors that are installed in the ground adjacent to the wall to apply opposite horizontal pressure that will straighten any bowing or leaning. Carbon fiber strips are another method used to repair walls; these strips strengthen and stabilize the walls, locking them in place and closing cracks. 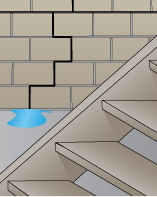 If you happen to have a wet basement or crawlspace, Atlas Piers can help with that as well. Our encapsulation services involve installing a vapor barrier along the walls of a basement or crawlspace to seal out moisture, leaving your home dry and mold-free. Are you building a new home in Athens, Georgia? We can assist with your new construction projects as well. Helical piers are very versatile and can be used for new construction as well as foundation repair projects. A good strong foundation from the start is so important. When you know your foundation was built right, you can rest assured that the rest of your home is safe. Whether your home is experiencing sticking doors and windows or bowing and leaning walls, you don’t need to worry, give us a call at Atlas Piers today for an estimate. We can find the solution and knock out the source of the problem. So contact us today for all your foundation repair Athens GA needs!